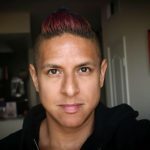 As many of you know, I am moving to Bangkok, Thailand in October of this year (to pursue a freer lifestyle…be free my sheeple!) 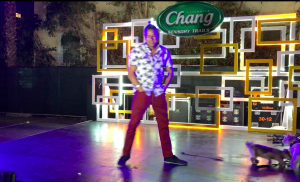 so I was super excited when Chang Beer invited me to their event in Hollywood, CA called Chang Sensory Trails to try some local LA Thai cuisine & drink some Thai-imported Chang Beer. This event had a ton of local Thai food trucks but the one I picked was WatDongMoonLek. 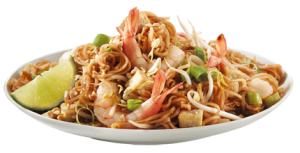 I had their Pad Thai which was delicious! Perfect combination of sweetness & spiciness. If you don’t believe me, perhaps you’ll believe their almost-1,000 Yelp reviews. Of course there was plenty of Chang Beer to go around. I’m not too big of beer drinker these days but I actually like Chang Beer. It has a light, refreshing taste and it reminds me of my future home in Thailand. It’s also a good thing I drank a few beers because as soon as I saw the stage, I lit that thing up with my incredible dance moves & aggressive nightclub antics. Last week, @dashofting & I were invited to celebrate the grand opening of SweetFin’s newest location on the iconic & highly-instagrammable Abbot Kinney. 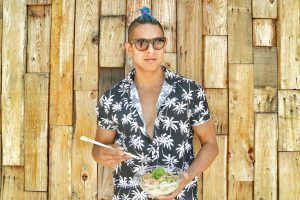 Being that salmon poke bowls are one of my favorite foods that I discovered after moving to Los Angeles in 2015, I was so excited to try their Salmon Yuzu bowl. 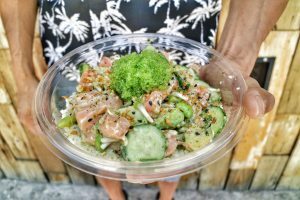 For those who haven’t heard of or tried poke yet, you can learn all about it here, but it’s usually raw fish, vegetables and either a kale, seaweed, salad or rice base. If you’re trying to keep it healthy like me, you’ll either go for the brown rice base or something carb-free like kale or salad. I always add avocado, jalapeños, onions, crispy onions & Sriracha to my bowls. 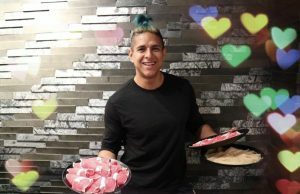 We got to meet the owner of Sweetfin and women entrepreneur Dakota Weiss who is a culinary and business rockstar who appeared on Top Chef. Enjoying my Salmon Yuzu bowl from Sweetfin while casually looking off into the ocean. What makes the poke in California special is that it’s only 1 of 2 states in America that do not flash freeze their fish (Hawaii is the other state). This means it tastes better & fresher and this salmon bowl was no exception. What’s also interesting is that their tobiko was green, when usually these little eggs are orange. That’s because Sweetfin adds wasabi into their eggs which gives them both a green color and a wasabi-spice. I’ve been living in LA for almost 3 years and I never checked out the iconic Santa Monica Stairs until this week. I’ve always heard that running up and down the stairs (170 steps) a few times is a good workout and they weren’t wrong. First off, this neighborhood is absolutely stunning. The houses are quite expensive. 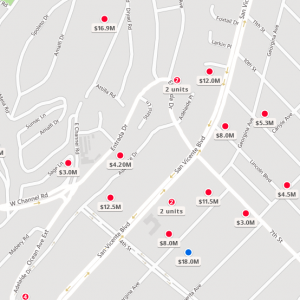 I hopped on Zillow to check out the prices and you can see the prices range from $3 million USD up to $18 million USD. Yeah, that’s probably not happening in my lifetime. Once you get close to the stairs, you start seeing a lot of people exercising in the general area. I saw a lot of runners, a woman using resistance bands for a thigh workout, and a guy shoulder-pressing 30 pound dumbbells that he keeps in the back of his SUV (not sure why I haven’t thought about throwing a few dumbbells in my trunk and basically having a mobile gym). It’s a good place to workout because seeing all the people exercising can be more motivating than working out alone. However, keep in mind that you can’t park on the streets after 6pm or you might get a ticket. Shout out to the fellow stair-climber who mentioned this to me at 5:57pm as I was filming my vlog. She’s the real MVP. I did 1 climb and I was sweating, out of breath and my heart rate was certainly elevated. I’m going to hit these steps tomorrow as my diet has been a little brutal lately (including a Happy Meal from McDonald’s last night). And if you liked my pants, you can get them on Amazon. Super comfortable and very affordable. Just look for SUPERBODY. Have you ever heard of Hot Pot? 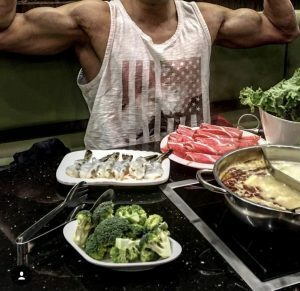 I define hot pot as “THE MOST DELICIOUS WAY TO GET YOUR LEAN GAINS ON.” Seriously. Hot Pot is basically broth, with thinly-sliced meats (proteins) & veggies (super healthy). 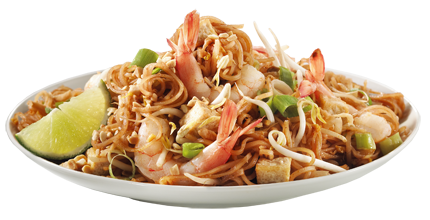 Of course you can add in noodles and other carbs if you wanted, but if you leave those out, you have a really healthy meal. I like to add spinach, baby bok choy, lotus root & broccoli. I always pick the spicier broths. Yo soy Mexicano! Now I’ve been to many hot pot restaurants from Taiwan, to Hong Kong, to Cambodia, to New York City to Los Angeles & many more, and I was surprised that my favorite hot pot restaurant is a global chain! Ironically (based on my blog name), the restaurant is called Little Sheep Mongolian Hot Pot. The first time I tried this restaurant was completely by happenstance. Early 2017 I was staying in NYC for a work trip and the only pet-friendly, affordable and convenient hotel I could find on Hotel Tonight was in Chinatown, NYC (Best Western Bowery Hanbee Hotel). At 10pm I went searching for food when I stumbled across an “All-You-Can-Eat” hot pot sign. Sold. Being that I was in LEAN GAINS mode (building muscle while losing fat), I made sure to only order meat & veggies. Here’s a wonderful picture of my flexing at the excitement of this clean meal. 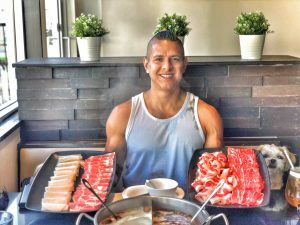 Back in LA, I was absolutely thrilled when I found out there were multiple Little Sheep Mongolian Hot Pots in the Los Angeles area! The one closest to me is in Torrance, CA, a city of LA that’s known for their authentic Asian cuisines. Torrance has the 8th largest Asian population in America at almost 40%. It’s no wonder this is a go-to area for delicious Asian cuisines. Source. I’ll review some more restaurants from this area in the future! In mid-2017, Little Sheep Mongolian Hot Pot stopped offering an All-You-Can-Eat menu but it didn’t matter. I was hooked. I was happy to pay almost double the price for the same amount of food because I enjoyed the flavors and the experience that much. I love their strategy – get the people hooked on their food at an affordable price, and then increase it after we’re addicted because we’ll pay anything! And some good news everyone! Little Sheep Mongolian Hot Pot recently brought back their All-You-Can-Eat menu!!! #winning. I’m not sure what the prices are across the country but the Torrance location was $23.95. If you haven’t been here yet, check it out!